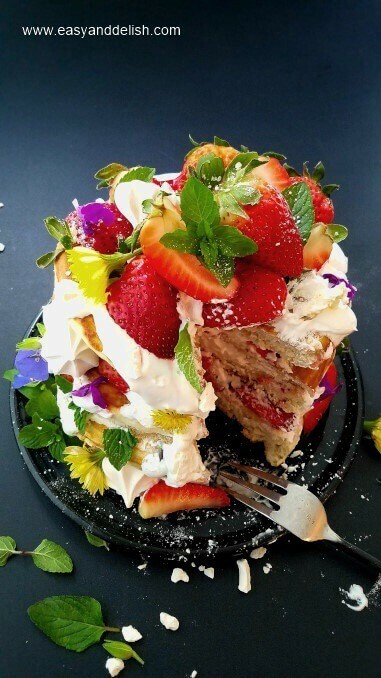 Strawberry Shortcake Pancakes that are easy, tall, super fluffy, and topped with whipped cream and fresh strawberries. These can be served as a dessert/snack, or alternatively served for breakfast by replacing whipped cream with Greek Yogurt. Pancakes for breakfast or brunch? Yes! But how about Strawberry Shortcake Pancakes for a dessert or snack that are as fluffy as a pillow? I am tellin’ ya, these are so good that I often find myself craving them. It is like savoring a classic strawberry shortcake, but in the form of pancakes. They can be made ahead and either refrigerated for a couple of days or frozen for up to a month. I enjoyed mine in the mid-afternoon with a good cup of latte! Soooo good! If you feel like having dessert for breakfast, don’t be shy! It is a great way to start the day with a big smile on your face. But if you want to keep things on the light side, replace whipped cream with Greek yogurt, and if desired, sprinkle on just a little bit of granola. The process is quite simple! First combine the dry ingredients in a bowl: flour, sugar, baking powder, baking soda, and salt. Next, whisk egg and butter into buttermilk. Pour the buttermilk mixture into the flour mixture and whisk just until lumps are gone. Heat a small skillet over medium heat and brush bottom of skillet with vegetable oil. Pour 1/2 cupfuls of batter onto the skillet, and cook until bubbles appear on the surface. Flip with a spatula, and cook until browned on the other side. Repeat process for each pancake. 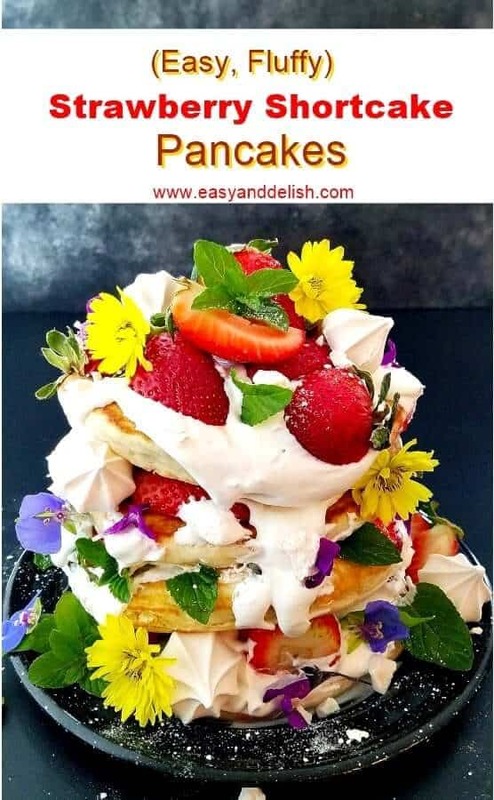 Top each pancake with whipped cream (flavored with a few drops of pure vanilla extract if desired) and fresh strawberries. Enjoy while Strawberry Shortcake Pancakes are still warm. If desired, use Greek yogurt instead of whipped cream and sprinkle on just a little bit of granola. Strawberry Shortcake Pancakes that are easy, tall, super fluffy, and topped with whipped cream and fresh strawberries. These can be served as a dessert/snack or alternatively served for breakfast by replacing whipped cream with Greek Yogurt. Combine the dry ingredients in a large bowl: flour, sugar, baking powder, baking soda, and salt. Next, whisk egg and melted butter into buttermilk. Pour the buttermilk mixture into the flour mixture and whisk just until lumps are gone. Heat a small skillet over medium heat and brush bottom of skillet with vegetable oil. 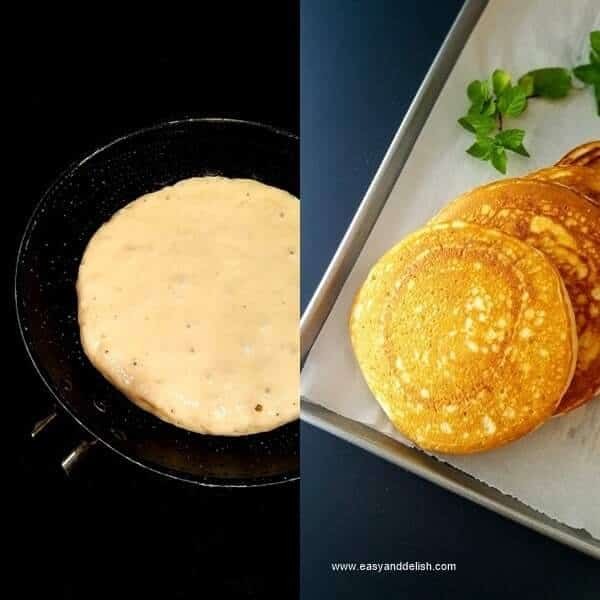 Pour 1/2 cupfuls of batter onto a 8-inch skillet, and cook until bubbles appear on the surface. Flip with a spatula, and cook until browned on the other side. Repeat process for each pancake. If desired, use Greek yogurt instead of whipped cream and sprinkle just a little bit of granola. 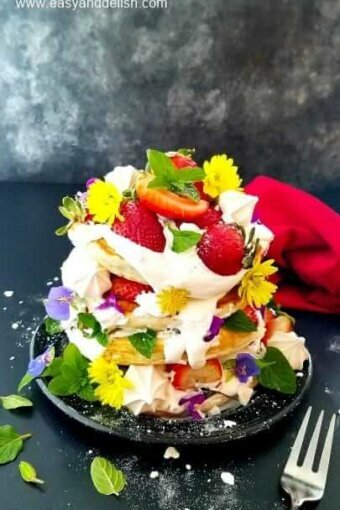 Top each pancake with whipped cream (flavored with a few drops of pure vanilla extract if desired) and fresh strawberries. Enjoy while Strawberry Shortcake Pancakes are still warm! To freeze our homemade pancakes properly, stack each pancake in between a sheet of parchment paper. Then, place the stack of pancakes inside a heavy-duty freezer bag and freeze for up to one month. To thaw, place them in the refrigerator. Heat carefully in a toaster or in a microwave (time varies according to pancake size and microwave power). For our pancake size, it should take about 20-30 seconds for each pancake heated in a 1200-Watt microwave. So vibrant and inviting ! I am so excited about spring strawberries! This lush recipe captures the exuberance of the season. What a neat idea! Bet this tastes awesome, and it’s SO PRETTY! Good stuff — thanks. This is so pretty, Denise! A showstopper dessert, and it makes a great party centerpiece. These are the most beautiful pancakes ever Dennise. What a creative soul you are! 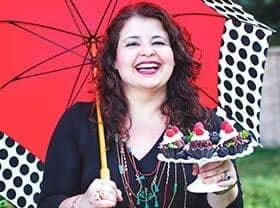 That recipe is amazing and the styling to die for!! Love it! They look so decadent! I say yes to pancakes for dessert!